‘Latexco classic’ mattresses are made from a blend of natural and synthetic latex. In our ‘classic’ mattress range, we offer two strong and distinct product families. Our standard latex products are made of solid, synthetic latex, enriched with natural latex to improve the mattress’s resilience and progressive support. Our top-of-the line ‘classic’ mattresses are produced in our iconic Innergetic mix with a high degree of natural latex. These products excel in resilience, progressive support and durability. For over 15 years now, our Innergetic mattress has been the mattress of choice of professional sportsmen. The customers themselves choose the thickness and size of the mattress, as well as the density/hardness. The comfort zones in the mattress, e.g. at the level of the sleeper’s shoulders and hips, can provide better support to the body. There are “classic” mattresses with single pin patterns and with three, five or seven zones. For bedding manufacturers who want to personalise their mattresses (logo, design, etc. ), we can produce tailor-made mattresses, using custom-designed moulds. We can also post-treat our mattresses to make them fire-retardant. The standard blend is enriched with natural latex in order to improve the mattress’s resilience and progressive support. 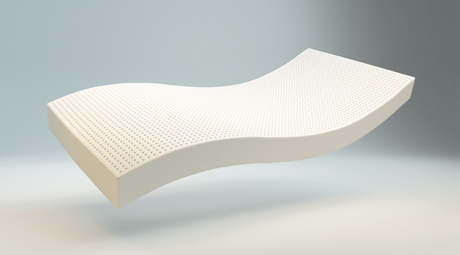 A stift mattress core has a uniformly perforated surface. The hardness/density is identical over the whole mattress. Thanks to the comfort zones, each part of the body is correctly supported. The zones ensure that the spine, when sleeping on your side, is kept nice and straight. And, when lying on your back, that the natural curve is maintained (normal lumbar curvature). The Latexco ‘classic’ range comprises mattresses with 3, 5 or 7 comfort zones, each of which supports a specific part of the body. We determined the exact positioning of the comfort zones in partnership with the renowned Institute of Ergonomics in Munich. Our mattresses can also be post-treated to make them fire-retardant, on the basis of a patented technology. In this way, they fulfil the main fire-retardant standards in the bedding sector.